We at Holiday Barn Pet Resorts have become aware of a canine cough, or “doggie cold”, that is occurring in pockets of our Richmond area community. It has impacted the Midlothian and South of the James areas more aggressively in the last several months, less so on the west end. We have seen a spike of symptoms at our Johnston Willis facility just in the last 24 days. The dogs showing symptoms have primarily been in Doggie Day Camp or housed near dogs that were in camp. The symptoms of this dog cold are a subtle to a more aggressive cough, sometimes paired with nausea, although some dogs show no symptoms at all. Symptoms will appear within 5 to 22 days after being exposed to the virus. The doggie cold, as we will call it, has often been diagnosed as bronchitis, kennel cough, or environmental allergies by local veterinarians. It is contagious and should be monitored and treated. We have been particularly concerned because of the overall interest in the health of our guests in general, but more specifically because of the similarity of cough found in Kennel Cough. We make certain to have all our guest’s vaccination records on-file before they visit, and that includes the Bordetella (aka, “kennel cough”). We are proactively meeting the challenge of keeping the doggie cold from spreading in our facilities by denying entrance of suspect dogs, restricting access to Camp, sending dogs home when symptoms are displayed, and earnestly watching and listening to our canine guests. We are notifying customers, cleaning aggressively, and isolating symptomatic guests when necessary. A dog’s life is all about slobbering all over toys, sharing water bowls, and drooling all over each other while at play. Colds are airborne viruses that live and breed in saliva. It’s no wonder dogs are so easily infected. 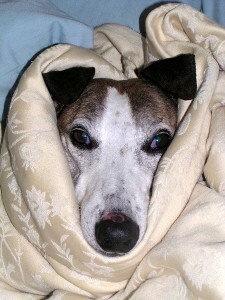 There are some things we can do, however, to help prevent them from catching the doggie cold. First of all, make sure your dog is up to date on all vaccinations, particularly the Bordetella and all strains of the Dog Flu. The respiratory benefits from these vaccinations may actually help to decrease your dog’s symptoms. Avoid unmonitored doggie social areas. Unfortunately, dog parks are always suspect. This is a good time for more one-on-one trail walks and obedience practice. If your dog visits doggie day camp, ask if there have been any cases of the cough. If so, don’t return until they can verify they no longer have symptomatic dogs. Be good listeners. This virus typically starts with a very subtle cough. If it lingers seek treatment from your vet and adhere to the treatment prescribed. As Dr. Nash advises, take your dog in for an examination as soon as symptoms occur. A cold can turn into a more aggressive illness. There is no vaccine for a doggie cold. Like a human cold, it has to run its course while treating the symptoms to return dogs to their normal, happy routine very quickly. If you have a dog that is challenged in breathing or already has a compromised immune system, please don’t put off treatment. Unfortunately, a dog cannot tell us they’re not feeling well. We typically do not know they have an illness until they become symptomatic. React quickly, before they can transfer the illness to other dogs. Lastly, make sure your dog’s physical body is in its best shape to help prevent a host of diseases and viruses from taking hold. Healthy foods, regular exercise, and adequate rest will help to boost their immune system. Always provide plenty of fresh water, changed a couple of times daily. Please let us know if your dog has shown any symptoms of the doggie cold so that we may monitor its progression and hopefully soon, it’s eradication. Error: Error validating access token: Session has expired on Monday, 29-Oct-18 09:08:51 PDT. The current time is Thursday, 18-Apr-19 20:16:13 PDT.